New York City Attraction Ranked with the Grand Canyon, Central Park, and Hana Highway in Maui, Hawaii, as Top Places to Visit in U.S.
New York, NY -- Rockefeller Center's historic Top of the Rock Observation Deck, which presents an incomparable place from which to understand and celebrate New York City, was recently named one of the top 10 U.S. attractions by Trip Advisor, the world's largest on line travel community. The deck includes three lower levels and three upper levels housed in the 70-story architectural heart of Rockefeller Center, 30 Rockefeller Plaza, in the center of Manhattan. The observation deck was first opened to the public in 1933. The multi-level Top of the Rock offers state-of-the-art features such as reserved-time tickets, multi-media exhibits, an indoor viewing area and transparent safety glass panels to allow completely unobstructed open-air views encompassing some of the city's most prominent landmarks, from the Chrysler Building to the Statue of Liberty to all of Central Park and the Hudson and East rivers. "We are thrilled to be ranked among such world-class attractions as the Grand Canyon here in the U.S. and, in Europe, the Colosseum, the Louvre and the Eiffel Tower as top global attractions by Trip Advisor," said Keith Douglas, the Director of Marketing for Top of the Rock. "Tens of thousands of visitors have experienced New York City from a fresh and unique vantage point on our Observation Deck. It is even a greater honor to be included in this list from Trip Advisor because it is all based on guest feedback from those that have visited Top of the Rock. There is no greater accomplishment or compliment in the tourism industry than to be recognized by your customers for delivering an outstanding guests experience and true quality service." Top of the Rock features numerous exclusive attractions, including two crystal installations by Swarovski; the Target Breezeway, a space that showcases state-of-the-art motion-detection technology; the sky shuttle elevators, where participants observe their own rapid acceleration through the shaft; and the "Weather Room," a triple-height premier special event space on the 67th floor. Visitors to the Observation Deck at Rockefeller Center will also be the first to experience a hand-held, interactive tour guide device with a built in Global Positioning System (GPS) created expressly for the attraction. Dubbed "CityShow," a first-of-its-kind, high-tech, audio/visual aid, provides historic facts, anecdotes, photos, music and descriptions of the many features of the observation deck with a simple touch of a button. CityShow also has a satellite detector &endash; so, when a visitor is on the upper decks looking at the view, the device will be able to determine where they are facing and point out the various landmarks and buildings encompassed in the unobstructed, 360-degree views. Top of the Rock is the only attraction to offer this technology and is now available in four languages: Italian, German, French and Spanish. 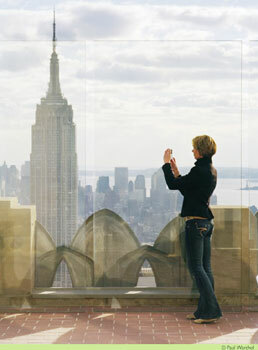 Top of the Rock is open daily 8:00 AM to midnight, with the sky shuttle making a final run at 11:00 PM. Ticket prices are $17.50 for adults, $16.00 for seniors and $11.25 for children six to 11 years old. Those interested in visiting Top of the Rock can reserve their visits via the website www.topoftherocknyc.com or call 877-NYC-ROCK (877-692-7625) or 212-698-2000. In addition, there are several terminals on-site to help visitors purchase tickets easily. Situated in midtown Manhattan, Top of the Rock provides visitors with an opportunity to appreciate the architecture of Rockefeller Center and its significance to the growth of New York City. Tishman Speyer, co-owners of Rockefeller Center, are committed to the preservation and restoration of Rockefeller Center, which is the site of numerous public exhibits and events, including annual installations of public art, the New York International Orchid Show, the Christie's Collector's Car Show, and live broadcast of the U.S. Open tennis championships. Each day an estimated 250,000 people walk through the Rockefeller Plaza complex, which is home to the world's most famous Christmas Tree.